Tempurpedic was one of the first big names in the foam mattress industry, and they’re probably still the most recognizable brand around. We’ll be taking a look at the Tempurpedic Cloud supreme Breeze for this review, which is one of their better selling mattresses. The real question, though, is if the Tempurpedic brand can live up to the hype, and justify its substantially higher cost. Should I Buy the Tempurpedic Mattress? 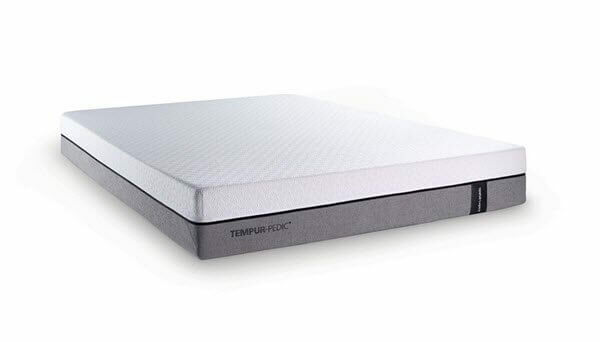 The Tempurpedic Cloud is 11.5” thick and is constructed from four different layers of foam. This combination of foams gives the mattress many different abilities and imparts several unique qualities onto the mattress. Top – The top layer of the Cloud is designed for comfort. It is made from 2” of visco elastic memory foam. It has a very soft feeling that welcomes the sleeper to the bed, and is the source of most of the hug and contour the mattress creates and that is synonymous with the Tempurpedic brand. Second – The second layer is made for support as well as comfort. It is also made from 2” of visco elastic foam, but is firmer than the topper layer. Therefore it gives a comfortable feel, but also starts the process of affording support and works with other layers to create a transitional zone between the top layer and the foundational layer. Third – The third layer conists of 4” of polyurethane foam. It is designed for support and helps ease sleepers into deep compression support, while buffering the top two comfort layers. Bottom – The bottom layer is made from 3.5” of polyurethane foam. It handles most of the deep compression support and also acts as the base for the mattress while helping the mattress keep its shape and firming up the edge support for the whole mattress. As you can see, the combination of different layers of foam at different densities is designed to offer sleepers the maximum amount of comfort and support. However, the Tempurpedic doesn’t take advantage of many of the other innovations in foam mattresses that have taken place over the years, like gel infusion and other strategies to aerate the mattress and help it sleep a bit cooler. The cover of the Cloud is made from polyester and spandex in a 94/6 blend. It is very soft and breathable. It is also quite responsive and does a good job of returning to its regular form. You can pull on it from any angle and it will return to its original place in a hurry. The cover is also a bit thin, which helps with the breathability of the mattress. The look of the cover conforms to other memory foam mattresses, with a white top and grey side panels. The white top has a quilted design on it which is rather sharp, and the design doesn’t create an awkward or uncomfortable feel to the mattress surface. All in all, it is a nice cover, but there’s nothing terribly special about its design or its look. The Cloud is designed to appeal to the widest audience for mattresses, and has a very neutral firmness. On a scale from 1-10 with 1 being the least firm and 10 being the most firm, the Tempurpedic Cloud ranks at a 5. The rest of the Tempurpedic line runs from a 3 to a 9 on the firmness scale. The support situation for the Tempurpedic is a bit unique, as sleepers will continually fall into it. This can be a pleasant sensation for some people, but others will find it annoying or off-putting. 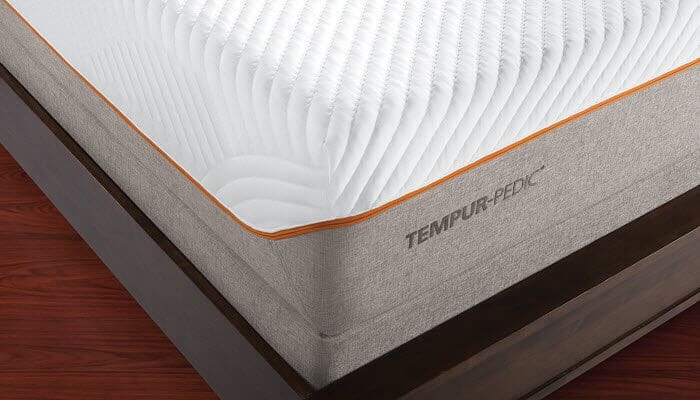 The Tempurpedic is one of the archetypes for foam mattresses, so one the things that sleepers will notice is that all of the things they’ve heard about memory foam mattresses, both good and bad, will apply reasonably strongly to the Tempurpedic Cloud. One good thing about the support of the mattress is that the heavy parts of your body aren’t the only ones that fall into the mattress, this makes the Tempurpedic Cloud a comfortable and supportive mattress for a good night’s rest for most people. Those who sleep on their side will especially enjoy the feeling of the Tempurpedic because of the way the mattress hugs and contours your body. While the Tempurpedic Cloud doesn’t use many of the innovations to create a cooler mattress, it isn’t overly warm either. The materials are cool to the touch when you first lay down on the mattress, and the cover provides enough airflow and breathability to keep the mattress at a reasonable temperature for most sleepers. Heavier sleepers might disagree with this because of the extreme hug and contour that you’ll experience in this mattress. Like most memory foam mattresses, the Tempurpedic mattress does a great job of minimizing motion transfer, so you’ll be able to get in and out of bed or change positions without bothering your partner’s rest or shaking the mattress much. The flip side of this is that the mattress doesn’t have the best bounce, which can put something of a damper on adult playtime in bed. We do sinkage tests on all of the mattresses we review so that you can get a better idea of how the mattress will perform in real life conditions and to help you understand the durability of the mattress itself. Our sinkage tests are done by an individual who weighs ~ 140lbs, so the results you get might be different. Laying on Back –When laying on the back in a normal sleeping position with weight evenly distributed, we measured 3” of sinkage. Laying on Side – When laying on the side in a normal sleeping position with weight evenly distributed we encountered 3.5” of sinkage. Slight Edge Sit – Sitting on the edge without resting the body’s full weight on the edge created 3.5” of sinkage. Full Edge Sit – Sitting on the edge and resting the body’s full weight on the mattress resulted in 5.5” of sinkage. Standing in Middle – Standing in the middle of the mattress with both feet flat created 6.5” of sinkage. Shipping – shipping is free. Orders take 1-2 days to process and 1-5 days to ship. 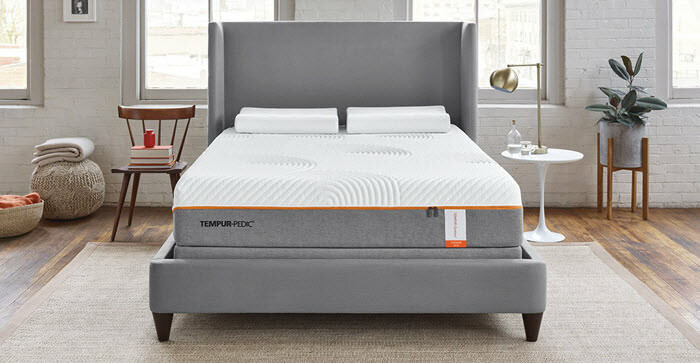 Trial – Tempurpedic offers a 30 night trial, which is much shorter than most other mattress companies. They also don’t allow for refunds or returns, only exchanges, which is also different from many of the other memory foam mattress retailers operating today. Refunds – Tempurpedic doesn’t offer any refunds. You can exchange the Cloud for another Tempurpedic model, but you have to pay $149 for the restocking and pickup fee. Warranty – 10 years, and you have to pay for the shipping for the new mattress. Keep in mind that Tempurpedic mattresses are sold by many different retailers, so you may find different stats, facts, and figures when researching things like the shipping costs, refunds, and trial period. That’s a good reason why you should always be very clear about what kinds of terms your company is offering on the Tempurpedic Cloud mattress so you can be sure what your options are in case you aren’t satisfied or if something goes wrong. This is a hard question to answer, as the Tempurpedic Cloud is a good mattress, but the cost of the mattress is so high. The trial period is one of the shortest around, and one would expect much more than you get for the money that you’re paying for the mattress. This means that the people who will enjoy the mattress the most will have very specific needs that can only be filled by a Tempurpedic mattress. There are plenty of other options that perform just as well or even better than the Cloud, and they cost less than half the price. In fact, many of them can be had for 1/3 the cost of the Tempurpedic Cloud. That being said, there are some people who will enjoy this mattress and find it worth the cost. Individuals who are looking for the perfect neutral firmness in a mattress will enjoy the Cloud, as it does a good job of splitting the difference between a firm and soft mattress. This is because of the way the different layers of foam are set up and constructed, and it allows the mattress to have a rare neutral firmness. People who really enjoy contour and hug will also enjoy this mattress. 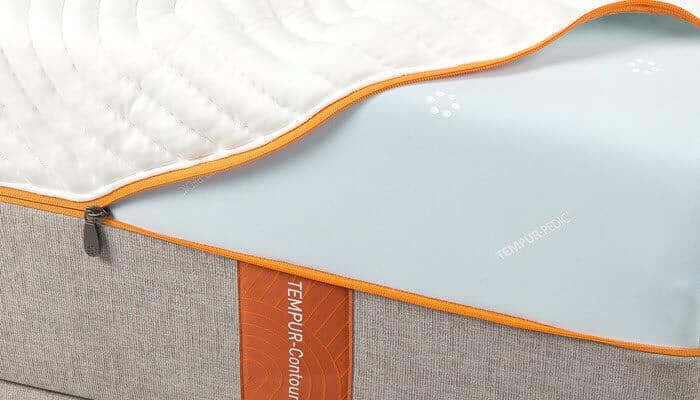 The hug and contour are more pronounced than many of the other foam mattresses on the market, so if that’s what you’re looking for in a mattress, then the Tempurpedic Cloud is the mattress for you. The amount of sinkage that you get with this mattress is higher than many other options, so sleepers who like feeling enveloped while they sleep will enjoy it. Finally, the Tempurpedic Cloud is a good option for people who like a slow response time from their mattress. The Tempurpedic takes awhile to change shape, and the memory foam is very high density, which means that you’ll get minimal motion transfer using this mattress. That makes it an appealing option for light sleepers who have the money necessary to afford the cloud. On the whole the Cloud is a good mattress, but we have a hard time justifying the price that Tempurpedic is asking you to pay. The result is that we think many of the other foam mattresses that are on offer in the market are probably a better buy for most sleepers.